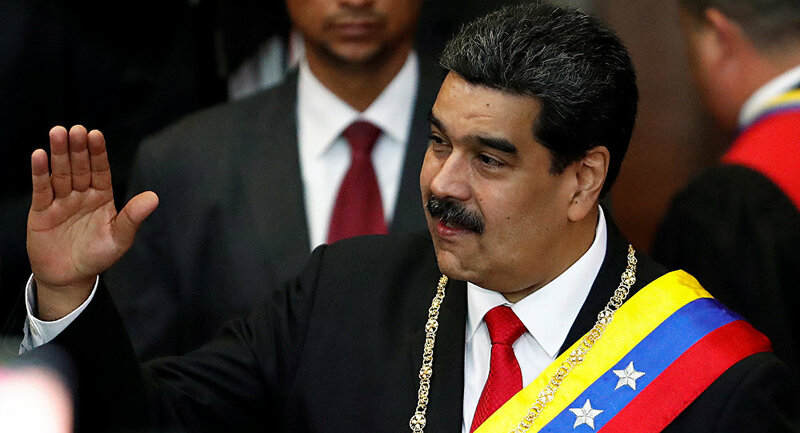 MEXICO CITY (Sputnik) – Venezuelan President Nicolas Maduro on Thursday joined a campaign to collect signatures for a letter to US President Donald Trump against a possible US intervention in Venezuela, as aired by Maduro’s Periscope channel. The United States has declared a humanitarian crisis in Venezuela to create a cover for its military plans, President of Venezuela Nicolas Maduro stated while speaking at the Plaza Bolivar in the centre of Caracas during a campaign to collect signatures against a US intervention in the country. "The humanitarian crisis is only a cover for the military plans of the Trump government. The whole crisis in Venezuela is that the United States imposed sanctions and imposed a financial blockade", he stated. Maduro came to the Plaza Bolivar in Caracas on 7 February, where one of the signature collection centres had been set up, accompanied by his spouse Cilia Flores. Both put their signatures on the letter to Trump. The campaign aims to collect at least 10,000 signatures against US intervention in Venezuela. The statement comes after Trump said on 3 February that a military intervention aimed at settling the current political conflict in Venezuela was an "option". Maduro has lashed out at his US counterpart suggesting that Washington is seeking to appropriate Venezuela’s oil assets. The campaign to collect signatures was launched on Wednesday and the letter is expected to be sent to the White House. On 4 February, a number of EU member states individually recognised Guaido as Venezuela's acting president after the country's authorities failed to organise a new presidential election in the country within an eight-day period set by the EU. EU countries were later expected to recognise Guaido in a joint statement, but Italy vetoed the motion. In January, Juan Guaido, the speaker of Venezuela's opposition-controlled National Assembly, proclaimed himself Venezuela’s interim president, contesting Maduro's re-election last year. The opposition leader was recognised by the United States and some other countries. Russia and China, as well as several other nations, have backed Maduro as the country's legitimate president and demanded the principle of non-interference in Venezuela's internal affairs be respected.